This is just a closeup of the restored quilt and the initial that was embroidered on it. I bracketed it with the feather stitch to stay in the basic "flavor" of the original quilt. 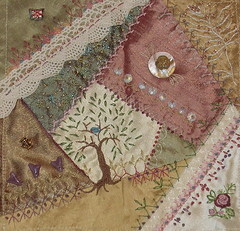 All the embroidery on this piece was redone as the thread on the original was disintegrating, pulled or missing. I tried to match the color as best I could, but chose to use a perle cotton instead of the stranded floss to help with wear. This is a pic of the full quilt restored. Whew!!!! I hope my son will cherish and it lasts another 25 plus years!!! :_) The only differences on this quilt from the original is that I did a couple of variations on the feather stitch and added a bit of herringbone here and there! I didn't realize how tiring it gets to use the same stitch for a project this size. Great learning experience! I also added the family name initial and the approximate year it was made along with the year it was restored on the front. I wish the makers had realized the importance of documenting their information in years past....but....alas...we have to rely on our own memories there! At least I had the opportunity to fix that problem on this quilt! Enjoy! A few days ago, I did a brazilian embroidery bee tutorial. I have since been asked to add a diagram.....and finally got a chance to make it. 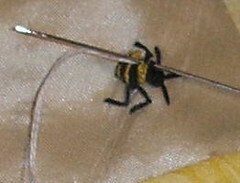 Each line running across the body of the bee represents the row of cast on stitches. Beginning with the rear row, the sequence of stitches is as follows: 3, 5, 8, 8, 5, 3. That is the number of cast on stitches that you will need to add for each ros. The head is made with a french knot....or a variation of it...I wrapped the needle 5 or 6 times to make a good sized knot. The antennae are made with the fly stitch and the wings are created with bullion knots. I wrapped the needle 35 times approximately. If you want a fatter looking bee or larger wings, all that is necessary is to increase the number of stitches or wraps. I have also made this little "hummer" with all bullion knots! That version is not as fuzzy looking, but is still cute. Another option would be to use the turkey stitch and cut the loops! Now THAT would be a fuzzy, buzzy bee!!! 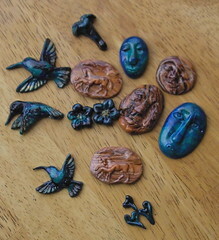 This is also a result of my Fimo explorations! 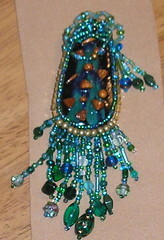 I joined into a beaded cabachon swap and needed to get this done and mailed. I layered the royal blue and the turquoise colors, cut a slice and pressed it in my noodle maker and came out with the base. I cooked that, then decided to add some metallic Fimo shapes which I attached with Liquid Sculpey and baked again. I then glued the cabachon to some interfacing, and started beading. I had no plan (as usual) but simply played a bit and this is the result. I'm a little worried about the loops at the top being a little too much, but...well...since i've already added some ultra suede to the back, i'm gonna have to leave it I guess. It was fun to do and the little group I belong too will be continuing to have swaps, so more are likely to come! Enjoy! 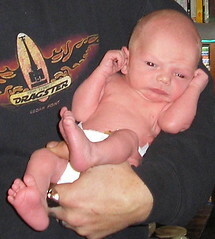 Other happenings on the home front, the day after Christmas....Caleb joined us! He popped into the world, weighing in at a mere 6 pounds, but if he's anything like his dad he will soon be chomping his way thru all the food in the house! I'm not always the best at keeping up with this blog...and this isn't really stitch related. BUT!!! 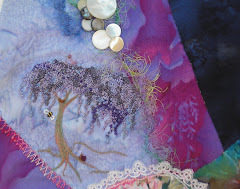 It is precisely why there hasn't been as much stitching going on as i'd like there to be!!! I have had to keep on bundling up and going out to shovel this WHITE stuff!!! :_) Here in Colorado, we have been absolutely covered up since four days before Christmas! The first snow we got about 31 inches here at my house with five foot drifts. We lost our blazer for a while there! LOL!! Next week we got about 8 inches of it and now THIS week we are supposed to get another 12 inches!!! Sheesh!!! What happened??? I like snow....but....WOW!!!! I thought this was rather a pretty rendition of our frosty covering tho! Voila! Completed honey bee!!! I just love to make these little dimensional gems! 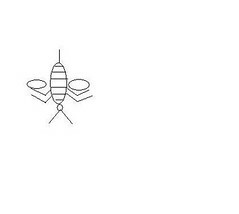 Sometimes, I will do a twisting, run stitch behind the bee to symbolize the movement and flight of the bee! Let your imagination run wild and have fun! When you are done, it will look like this. Also, if you are using Edmar rayon thread, you will want to wrap the thread clock-wise instead, to accomodate the "z" twist of the thread! Now, you need to hold the wraps and pull the needle through, completing the bullion. If the bullion twists a little bit, either tickle its tummy by running the needle gently under the loop or turn it a little bit between your fingers until it straightens out. You will now thread a needle with some white thread, knot it and pull it through the fabric directly to the side of the body of the bee. Pull the thread completely through. For the bullion stitch that makes these great dimensional little wings, you will need to take a tiny bite right beside the spot that the thread originally came through. Like the cast on stitch, DO NOT PULL THE NEEDLE THROUGH THE STITCH! giggles..... Wrap the thread around the needle about 30 to 35 times. 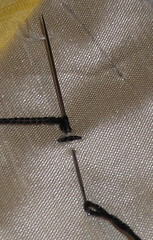 For the next set of black stitches, move your needle slightly outwards from the yellow stitches to accomodate for more stitches. This will create some dimension to the body and make the bee look more "pudgy". Now you will create eight (8) cast on stitches with your black needle and eight stitches with the yellow needle that will follow. Thennnnn....you will be back to the black thread! 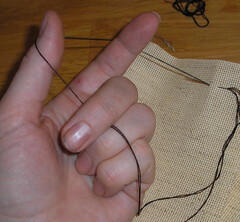 Reduce the number of cast on stitches to five (5) and again, park the needle. Yellow is the final row of cast on stitches and will consist of three (3) stitches. When you take the thread to the back of the fabric, knot it and cut it off. You're done with the body! Next, we will make the head with a french knot. If you prefer to use a colonial knot, go for it! I like the french knots (which for some reason I keep calling them pearl knots giggles...), as I can increase or decrease the number of wraps on the needle as I want and affect the size of the knot accordingly. In this example, I wrapped the needle five (5) times then took the thread to the back of the fabric again. 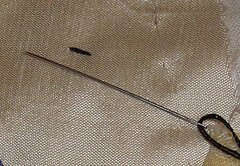 Now, for the antennae, bring your needle and thread to the top of the fabric approximately a quarter of an inch and to the right of the head, pulling the thread completely through the fabric. Move directly to the left, about a quarter of inch ( I eye this to make it look more realistic. All the "measurements" I am giving you are just approximations) and take the needle to the back of the fabric, then back up in the middle, right beside the pearl knot. Take this slowly, making sure that you catch the loop of thread. 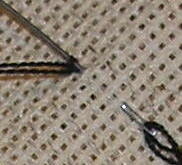 You will then tack the thread down by pulling the needle over the loop and back to the back of the fabric. Repeat these fly stitches four more times for the legs as shown here. Repeat the process and create two more stitches. You will then want to take hold of the the needle AND the stitches and pull the needle through the fabric and cast on's, closing the circle. This will create a little ridged loop over the fabric. Your thread will now be on the right hand side. You need to push the needle through the fabric at the base where the thread was originally brought up and draw the thread completely to the back. We will now need to switch to the yellow thread, so just "park" the needle and black thread to the side for a moment. 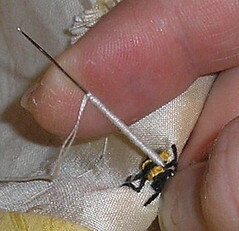 Repeat this process with the yellow thread, only increase the number of cast on stitches by one stitch. 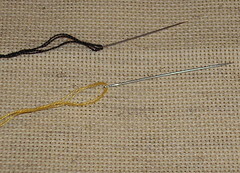 Draw the needle and thread through to the back of the fabric, just as you did with the black thread and temporarily park this needle and switch back to your black thread. 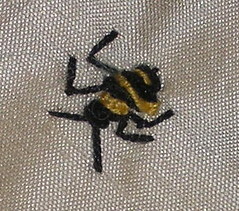 you will want to bring your thread to the top of the fabric about three quarters of the way up the stinger. 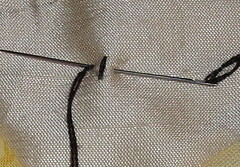 Take a "bite" of the fabric, from right to left, bringing the tip of the needle out next to the thread. DO NOT PULL THE NEEDLE THROUGH!!!! Here we will start making cast on stitches that create the body of the bee. I belong to the Hand-Embroidery group over at yahoo. They are a super group of folks and the owner Lillian and moderator, Melissa are just great! Long story short, Melissa has a blog, http://www.honeybeesbliss.blogspot.com, titled such for the meaning of her first name! At any rate, she saw the dimensional embroidered bee here that I had stitched on a pin cushion and wanted to know how to make it. Hmmmm.... wonder why? LOL!!! Soooo....i'm going to attempt to do a little tutorial here. If anyone has a question about any of the steps, please let me know and I will do my very best to help out! Also, if you are not familiar with the cast on, bullion or fly stitches, I would recommend that you practice on a "doodle cloth" before you jump into creating the bee on a block. The stitches are easy once you are familiar with them, but can be a little frustrating at first. DON'T let it stop you! Like anything in embroidery, practice and just relaxing to enjoy the process are all you need to start creating dimensional embroidery! To start out, you want thread two millners needles. I used size 11. One with black, the other with yellow. It's important to use millners needles as the cast on stitches and bullion stitches as the eye of the needle is the same dimension as the needle itself and will allow the stitches to slide easily off the needle. I prefer to use Edmar rayon thread, but don't always have it on hand, so will also use DMC embroidery thread (as shown here.) I vary the number of strands that I use as sometimes I want a bee that is larger (or smaller) than the example that I am going to show you. 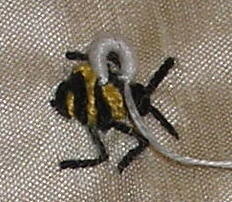 For this particular BEE I used two (2) strands of DMC thread. The bee will be approximately 1/2" when complete. We will be using the fly, cast-on and bullion stitch to create this little "Hummer"!! Another addition to my Take A Stitch Tuesday! (www.inaminuteago.com). This bit I did before I accidentally "found" the fish! :_) I was experimenting with changing the sizes of the stitches withing the row as well as their location. I like this idea from the perspective of creating the image of a fence on a block. It has potential if lazy daisy stitches or fly stitches are added to it as well. I'll have to continue to play with this one! This time I played with increasing and decreasing the size of the herringbone within the row. I was pleasantly surprised when I created a fish!! This will be GREAT for a project I have to do for a grandson! Woohoo!!! I think i'll try making the stitches a bit more dense then some of the fish can be more distant, some more up close! Even running another color under them...or weaving some organza type ribbon thru the stitches would be cool! Ohhhhh, the potential! I played around a bit more last night and came up with some variations that are new for me. I thought i'd share them with you. This is a pic of them overall. Then i've got close ups i'll share of certain ones. Enjoy! I am a part of a group of ladies that create Art Bra's and a special quilt for donation to various foundations for breast cancer. 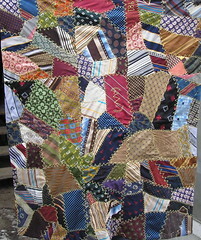 This is my raw block for the 2007 quilt. 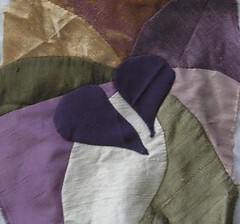 The theme is hearts and the primary color is to be purple. Well....that's a toughy for me, as I don't generally work in that color! I had to some digging to bet this one figured out! LOL!! But....this is what I created. I have my design ideas worked out on paper (also a rarity for me) and the thought behind this particular heart is that it was broken with disease and will be beautifully mended to create a new whole. I will add other heart motifs in the patches as well to show the strength of our spirits to overcome all obstacles! Enjoy! Stay tuned for further developments!